When the lights dim and the grand drape goes up, you see a polished, in the current moment, put together stage. 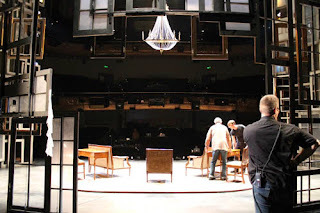 Scroll back a few days and imagine the actors, designers, stage hands, and scene shop crew filling the stage—weaving around the scenery and each other. A.C.T. 's production of Major Barbara exemplifies the intricate process of implementing a set design. During a performance it can be easy to glaze over the tiny pieces that make-up a design. For this reason, as the web development fellow, I took a step behind the scenes to help illuminate the depth of thought surrounding some of the tech process for Major Barbara.